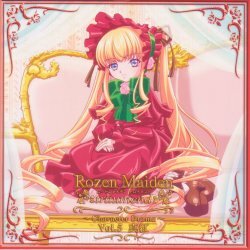 Shinku's Character Drama CD, the fifth in the series, was released on January 24, 2007. In it we get to explore more of Shinku's love for a certain dog detective. After Souseiseki's relatively serious drama, here we return to more of a pure comedy format. I gather that Shinku has a lot of haters, for someone who is nominally the main doll in the show. The stories on this CD, however, get in a lot of jokes at Shinku's expense, and there are some good scenes with the other dolls as well, so you shouldn't necessarily skip this one just because you don't like her. (Shinku is one of my least favorite, but I think I enjoyed this more than any of the previous character dramas so far.) Also, I get the impression that a lot of people are reading the scripts here without acquiring and listening to the actual audio. I'd urge you to listen to this one, though, as a pure-text translation can't do justice to the voice acting by Shinku and Suiseiseki in a few of the scenes. The time frame of the story relative to Träumend is in somewhere vaguely in the period between episode 6 (Suigintou rejoins the cast) and episode 9 (before everything turns serious for the rest of the series), but it is pretty independent of anything that happens in the series otherwise. If the release dates that I see are still correct, I get a short break this time before I must translate Hinaichigo's drama CD, which is due on February 7. Download a plain ASCII version (*.TXT) of the entire script here (41 KB).